Get a slice of adland direct to your inbox every Monday with opinion from Dominic Mills. Media Leaders brings together the latest weekly Newsline column from Raymond Snoddy with opinion from media experts covering every area of the industry. A weekly round-up of every story and opinion article from the week, with a selection of the best bits from the editor. Strategic foresight, penned by the award-winning futurist and WIRED Fellow. Delivered monthly. A client's perspective from one of the UK's best known brand marketers. Sign up for her monthly column. Keep up-to-date on Mediatel Events news and special offers, and be the first in line for exclusive and free events. 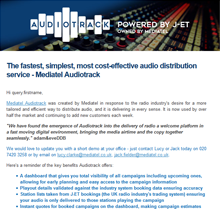 Be the first to hear about offers and new products from Mediatel. Get the latest news and updates on our audio distribution service. One or more bulletins should be selected. Already have an account? Log in using the link at the top of the page to manage your communication preferences.